Hey Day began with the inauguration of a “Moving-Up Day”, modeled after a similar custom already established at Syracuse University. The name “Hey Day” was agreed on by a committee a few weeks later. It was decided that Hey Day activities will extend to an entire week, rather than a single day. A gavel was presented to the newly-elected President of the rising Senior Class as a symbol of the duty he assumes for the coming year, a tradition that is continued in following years. 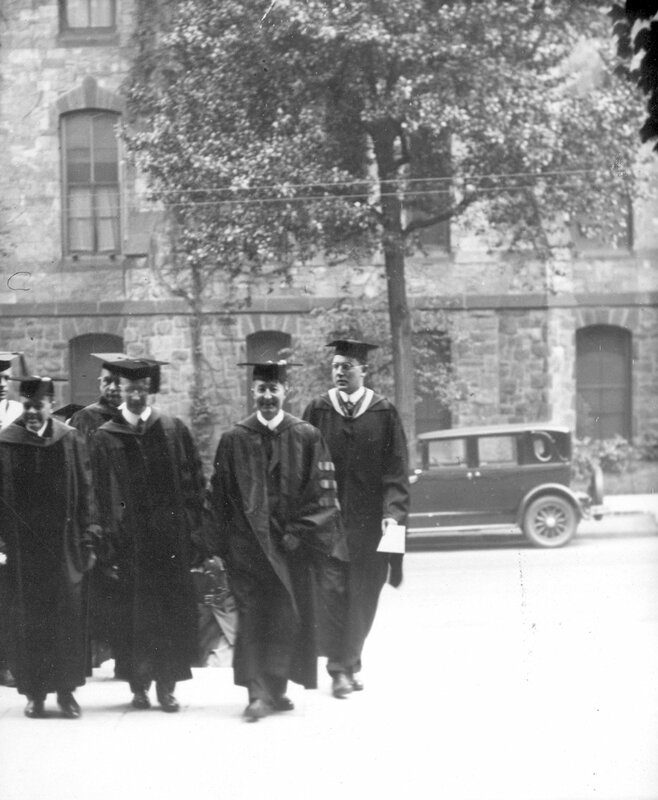 The custom of the seniors wearing caps and gowns from Hey Day until the time of graduation was abolished. Instead, seniors now appeared at the morning exercises in their blue and gray blazers, thereby starting a new fad that practically all of the American colleges were expected to follow: namely that the cap and gown be worn only at the Graduation Exercises. Women’s Hey Day was first celebrated, six years after the passing of the Nineteenth Amendment, which gave women the right to vote. Although there were no senior honors awards, the women’s ceremony, usually held in Bennett Hall, consisted of an academic procession, the changing of offices, a valedictory address, and the induction of new members into various honor societies. Women’s Hey Day was the same day and time as the men’s until 1954, when it was changed to the evening before the men’s Hey Day. The emphasis of Hey Day shifted away from student activities and celebration. The main focus of the day became the Hey Day assembly and the Honor Men awards, which primarily pertain to seniors. Class Day and Hey Day were officially combined into a single celebration known as Hey Day, and Ivy Day was also moved to the same date. This change was made as a result of students’ complaints that Class Day festivities conflicted too much with finals and commencement. Juniors, sophomores and freshmen were allowed to participate in the Hey Day celebration. A parade of classes was scheduled as an added feature. Such a formal march of students had never been held before, and makes Hey Day “the most interesting class ceremony because it does not pertain to boring speeches”, according to the 1938 Pennsylvanian. The parade, led by the University Band, started on the walk between College Hall and Houston Hall, and was divided into four units. Each group was composed of members of each class and headed by the class president, who carried the class flag. 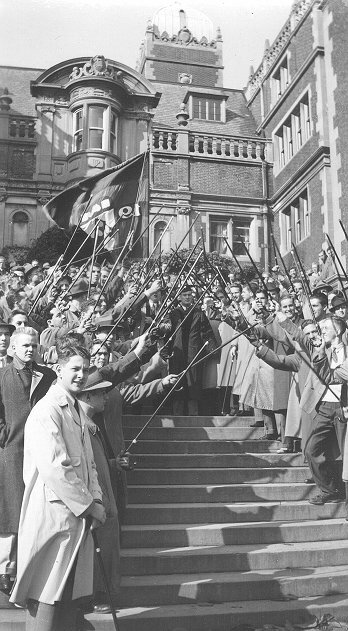 The march ended on the Junior Balcony in the Upper Class Quad, where grandstands were constructed to accommodate the participants and spectators. A public address system was installed for the purpose of this assembly. During the 1930s, undergraduate interest in Hey Day seemed to fall and even senior attendance was poor. 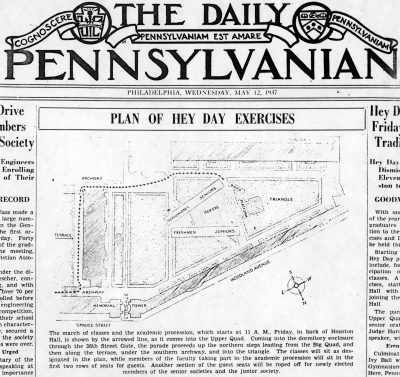 In 1940, seniors were given the opportunity to vote on improving the program of Hey Day exercises. Most seniors chose not to fill out the questionnaire and those who did respond chose to ridicule the poll, making pseudo-humorous remarks. This resulted in a vote by the Committee on Student Affairs to abolish Hey Day. The April 15, 1940 Pennsylvanian reported that the seniors’ blasé attitude and lack of interest in traditions were a disappointment that took Penn “another step away from her infancy”. 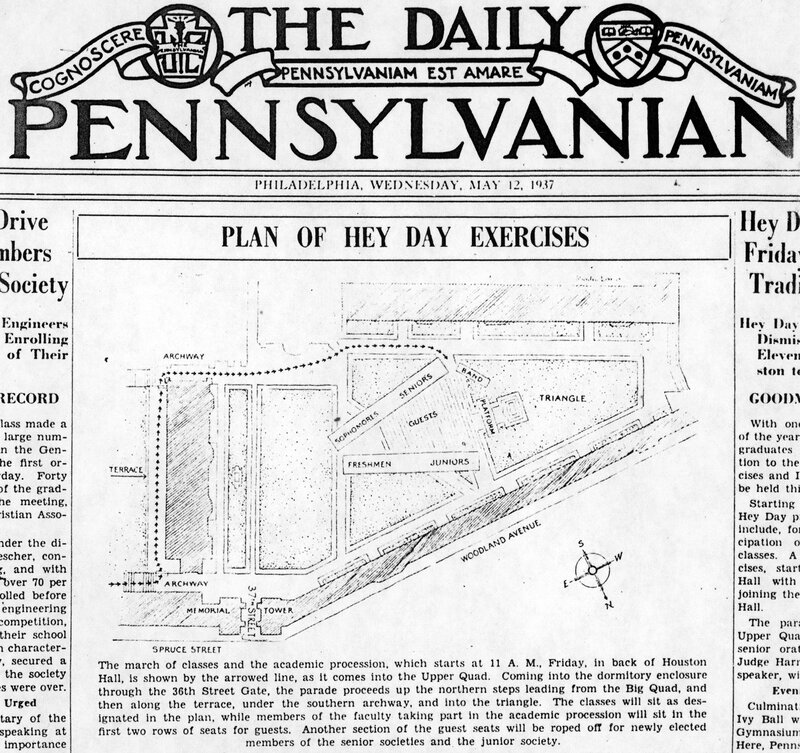 Pennsylvania Day, a class exercise inaugurated in 1939, was touted as Hey Day’s replacement. In early May, a student petition, reported to contain more than a thousand names, advocated the reversal of the decision to abolish Hey Day and the old custom was revived. Hey Day exercises were not held because of wartime conditions. Instead, a modified form of Hey Day, merged into Ivy Day, is held in its place. So many students had left the University to fight in World War II that it was felt that the usual celebration in connection with graduation was not warranted. Ivy Day featured a Senior Chapel and Ivy Stone unveiling, with the awarding of senior honors held off until graduation. Substantial differences between the new Ivy Day and Hey Day were illustrated by the elimination of the traditional Ivy Ball and the reduction in senior class activities. Instead of the senior class voting for the Honor Men, a faculty committee selected the winners of the Spoon, Bowl, Cane and Spade awards. With the end of World War II, students and the administration revived all the customs and ceremonies associated with the historical Hey Day. Preparations were made for a shorter, more interesting and more spirited Hey Day ceremony. To shorten the program, the organizers omitted the main speaker. The Friars Senior Honor Society added a new feature to the ceremony in the form of a senior march. The march, which became a lasting feature of the program, featured a distinctive article of clothing worn by the seniors, namely red-and-blue banded two-dollar straw hats. The idea of wearing straw hats for the march was originated by the Friars to give the ceremonies an added interest, much like the canes gave the Junior March. The seniors also carried canes, described as “black dress type with curved tops and silver bands”, which were sold for 75 cents. After being dismissed from their classes, the seniors, led by a marshal and cheer leader, marched from their respective schools to the library, where they saluted President Stassen with a song and cheer. Then they proceeded to Irvine Auditorium for the exercises. The Junior Cane March, a Penn tradition that was part of Junior Weekend until 1959, was reinstituted as a key feature of Hey Day. The march was previously held on the day of the Penn-Navy football game sometime in late November as part of the annual Junior Week activities. In the past, the march marked the conclusion of Junior Week and preceded the all-University Chapel Service, the poster display, the football game, and the Junior Prom. The 1965 Hey Day Junior March began at 3:30 p.m. at McClelland Hall with the singing of “Drink a Highball”. Decked out in ties and jackets, skimmer and honor society hats, and carrying canes, the juniors moved on to College Hall, where they were joined by Provost Goddard and Dean of Men Craft. The traditional Hey Day Services followed the march. Men’s and Women’s Hey Day ceremonies were combined into a single celebration for the first time. Styrofoam hats replaced straw skimmers. During the Vietnam War, a number of Hey Days were overshadowed by anti-war protests and demonstrations. In 1967, over 50 demonstrators wore gas masks during the annual Hey Day March as a protest against the University’s involvement in chemical and biological warfare research. 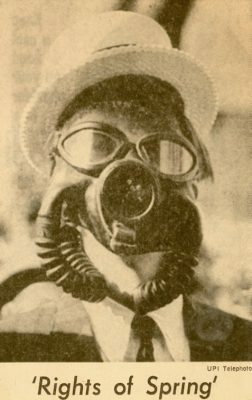 Many of the demonstrators wore the traditional skimmer hat, but with black bands around the rim. They were not allowed to walk with the main group of marchers to prevent any violence that might occur and so as not to taint the tradition of Hey Day. During the 1972 Hey Day, a group of students expressed their opposition to the United States’ policy in Southeast Asia by staging a sit-in on Walnut Street. The forty-five minute sit-in succeeded in blocking traffic as far back as Center City, but did not significantly impact the Hey Day ceremony, which went on as usual. Hey Day canes were made of cheap bamboo and sold along with styrofoam imitation-straw hats for $1.75. Juniors wore red and blue class T-shirts designed especially for the event. 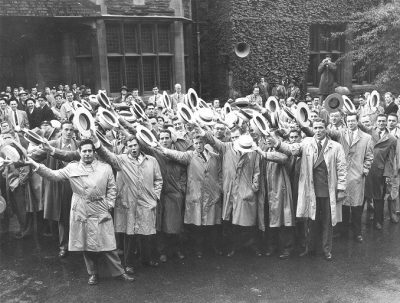 The tradition of juniors taking bites out of each other’s styrofoam “straw” hats became a part of Hey Day. 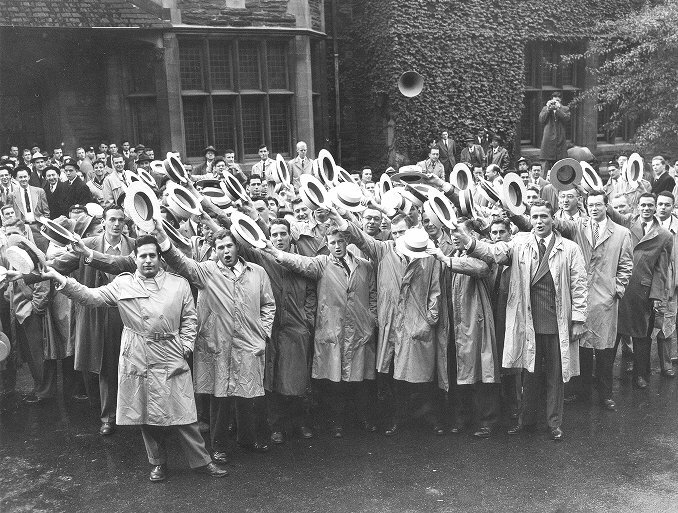 Although the exact origin of this practice is not known, the straw hat tradition dates back to 1904, when, to mark the revival of the annual Penn-Princeton baseball rivalry, The Pennsylvanian encouraged students to wear new straw hats to the game. During the 1990 Hey Day, a group of students poured beer over President Hackney, carried him out of his College Hall office on their shoulders and dropped him coming down the steps. The prank put the following year’s celebration in jeopardy, but student-led changes in the celebration kept it alive. Hey Day, held on the last day of classes, continues to mark the official passage of the junior class to senior status. Around 2002, marching juniors began the tradition of squirting each other with various sticky substances, such as whipped cream, caramel, chocolate sauce, and silly string. 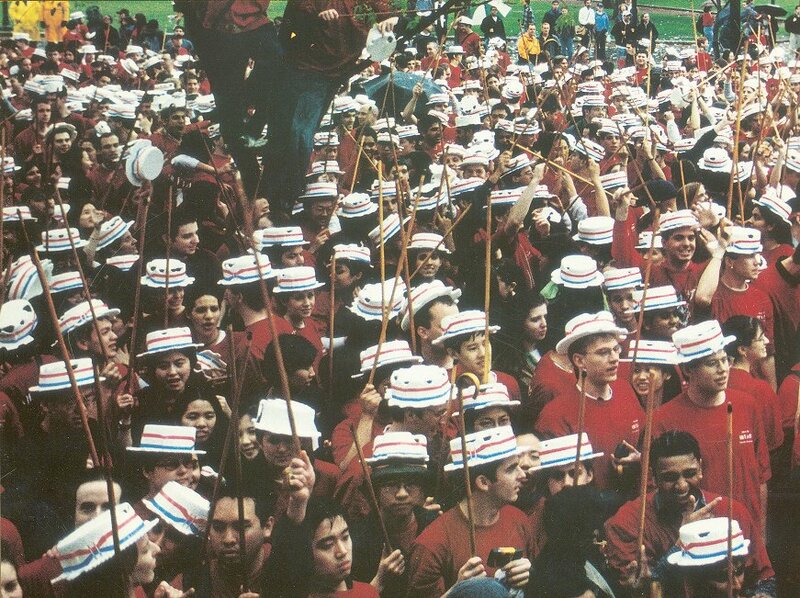 Hey Day has four major components: the march of the junior class from the Junior Balcony in the Quad to College Green, the President officially proclaiming them seniors, a picnic on Hill Square, and the sporting of fake straw hats, red T-shirts and canes. 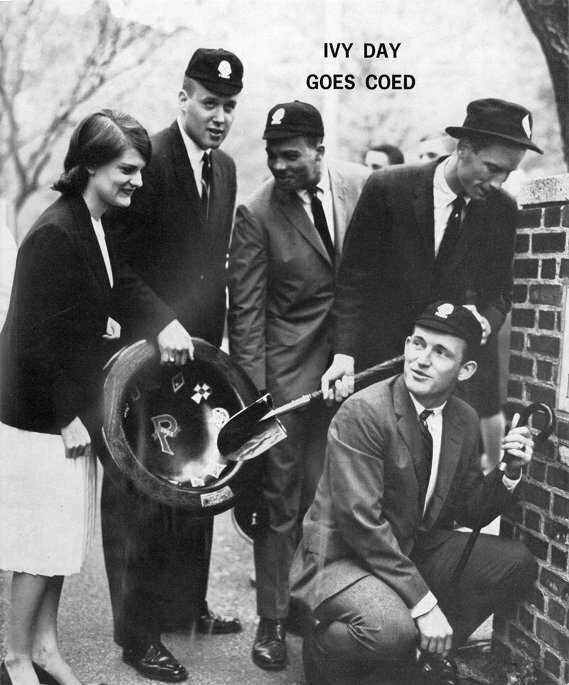 The tradition of presenting senior men with the Spoon, the Bowl, the Cane and the Spade awards lives on, but is held off until the Ivy Ceremony. Leading senior women receive the Hottel, Harnwell, Goddard, and Brownlee awards, which originated as a part of Women’s Hey Day.